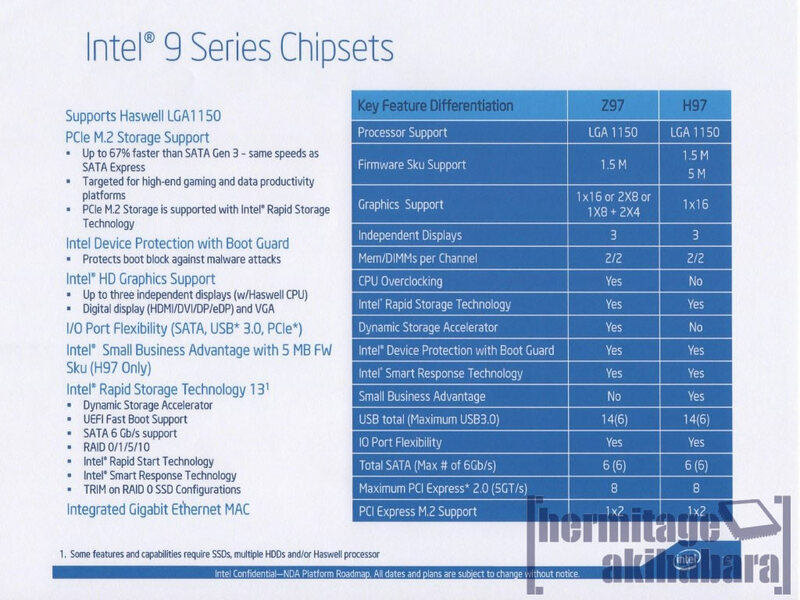 A short update, the Haswell Refresh ‘K’ Series will indeed be supported on the Intel 9 Series Motherboards, these slides were leaked by Hermitage Akihabra, a well known leak source. According to the slides, the Haswell Refresh K-Series processors would be specifically targeted for compatibility with the 9-Series chipset while the rest of the Haswell Refresh lineup would be compatible with both 8-Series and 9-Series chipsets. Images are courtesy of GDM.OR.JP! 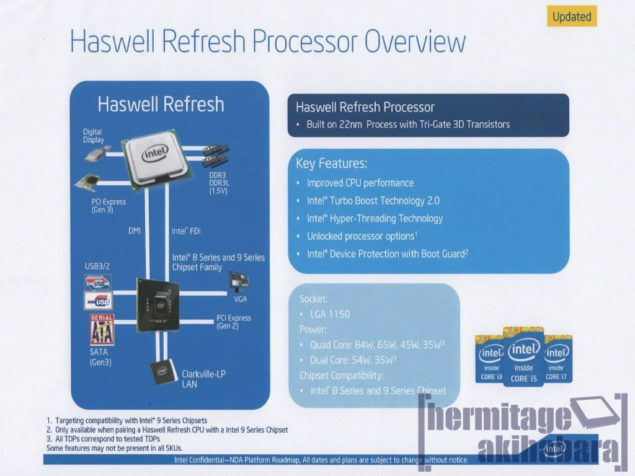 Now interestingly previously leaked slides actually show support for both Haswell and Haswell Refresh platforms and now we know that they also support the Haswell-K Refresh Platform. This should be good news for all the people who are left stranded from a new generation just because of a shift in motherboard. Here is the relevant slide from the leak. Notice the “Unlocked Processor Design” and the note ” Targeting compatibility with Intel 9 Series Chipsets”. This slide has leaked before by the way but this is an update slide as can be seen by the yellow note on the top right corner. 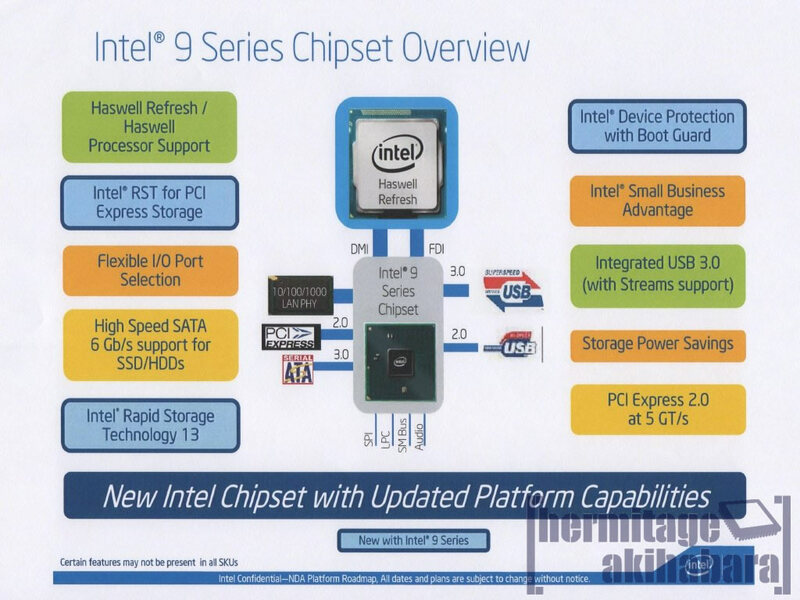 This is very interesting news for over clocking enthusiasts since targeted compatibility for the Intel 9 Series Chipset could mean future proofing for a short time. Ofcourse Intel has used the suspiciously ambiguous term “Targeting Compatibly” instead outright declaring support, which makes me think that our enthusiasm should be reigned in just yet. 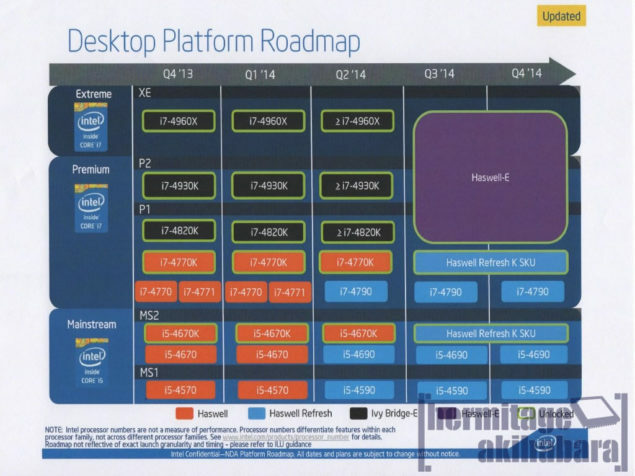 Since these are leaked slides and pre-release slides are bound to change, Intel might just decide to revert this change. If it can accomplish it in the first place that is. Other than the K-Series Unlocked options, the rest of the processor lineup would work with ease on current and next generation LGA1150 socketed boards. Intel initially launched their fourth generation Haswell processors in June 2013 at Computex. The processors featured the latest 22nm core 3D Tri-gate transistors technology which improved the IPC and efficiency by a decent amount of Ivy Bridge. While the Haswell processors were met with a great response and backed by a variety of overclocking features, the processors didn’t happen to be great at overclocking due to the cheaper application of TIM between the IHS (Internal Heat Spreader) and the Haswell silicon itself which resulted in the heat to remain trapped between the chip due to poor contact. Intel seems to finally be fixing this issue once and for all with their upcoming Haswell Refresh processors. The K-Series Haswell Refresh processors in specific are codenamed Devil’s Canyon which would offer used an improved design that incorporates updated packaging materials, improved TIM (Thermal Interface) and processors that are specifically re-engineered for enhanced performance and overclocking. So many users who have been waiting for Intel to update their TIM design since Ivy Bridge can now check out the new processors for their overclocking needs. 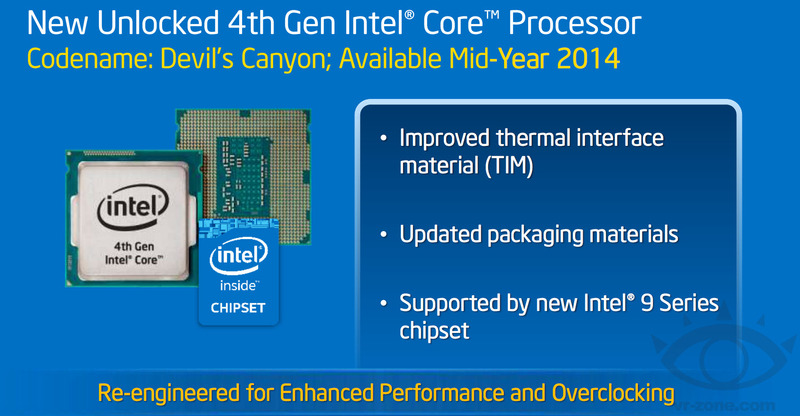 The Core i7-4790K will be the flagship processor of the Haswell Refresh lineup and the first 22nm consumer CPU to obtain clock frequency of 4 GHz. It will feature 4 cores and 8 threads along with a fully unlocked design which will allow users to overclock the chip past the limits thanks to the improved thermal design and updated package materials. The roadmap above shows that we might see faster Ivy Bridge-E iterations moving in Q2 2014 along with the Haswell Refresh SKUs. The unlocked variants will arrive in June in Q3 2014 followed by Haswell-E (Intel’s HEDT) platform which will bring consumers the first native 8 Core processor for the LGA2011-13 platform based on the X99 Chipset.